so, one of our rabbits died today. we knew it would happen eventually. but it was our little fuzzy white one, fizgig...named after the little white fuzzy creature in that jim henson movie, the dark crystal. he came from a breeder who couldn't care for her 150 rabbits...first they were seized, but then she surrendered them. we had no idea how old he was and all the rabbits we got in that group had so many health issues from neglect. we've had him for a couple of years and for that, we're grateful. dh buried him in our backyard tonight. one thing that surprised me was my teenager's reaction. he cried and cried...big, hard sobs. he and i talked about it tonight. first, he felt guilty...and i don't blame him. this is the first time i've seen a dead bunny, but i've had to have one put down before and that sucked. and i felt guilty. something so small and helpless...seems like i should've been able to do something to save it. 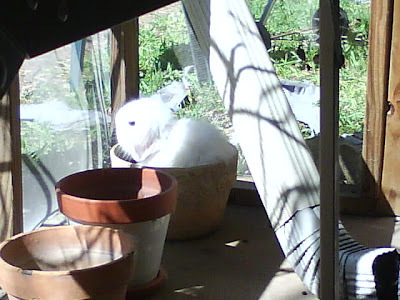 the other rabbit i've lost was a mama that had babies at my house...we were told she was a male. when i took her to get spayed, they lost her on the table. and i remember crying a lot over her, too. but i told my oldest that we did the best we could taking care of our little friend...and that it was okay to feel sad over losing a little part our lives. my teen did say he was kind of surprised by how strongly he felt over losing fizgig. my youngest said he wished it had been the rabbit who bites sometimes when he's hungry that would've died. ahh...the circle of life. Hugs to all of you. It's never easy to lose a part of the family, no matter how small or furry they are. Sending my love to #1 son and the rest of the klan..